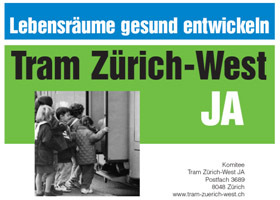 The 25th November is fast approaching — this is the date of the cantonal referendum on Tram Zürich West, or more precisely the cantonal contribution of 90 million Franks (half of which could be directly recovered through a federal contribution if work starts before the end of 2008). To support the yes campaign, the exhibition tram (768) took a tour of the canton on the back of a low-loader lorry on Saturday 3rd November. Some pictures can be seen on Adrian Senn's website, railimages.senn.ch. It also seems likely that, for safety reasons, construction of the line will not begin until after the European football cup (2008). This means the opening date may possibly slip once again, to 2011. Readers who have been following this newslog since 2003 will remember it was originally planned to have the line operational in time for this event. Opposition against the project has shifted from the right to the left wing, with several SVP politicians being supportive, whereas local left-wing groups are spearheading the no-campaign taking objection to a large part of the money being allocated to the parallel Pfingstweidstrasse road. For the inhabitants of the city of Zürich, this is the second time in half a year they are called to vote on the project. In June, 69.5% voted in favour of the city's contribution of 59 million. This makes it very likely that the cantonal referendum can also be won with a clear majority. 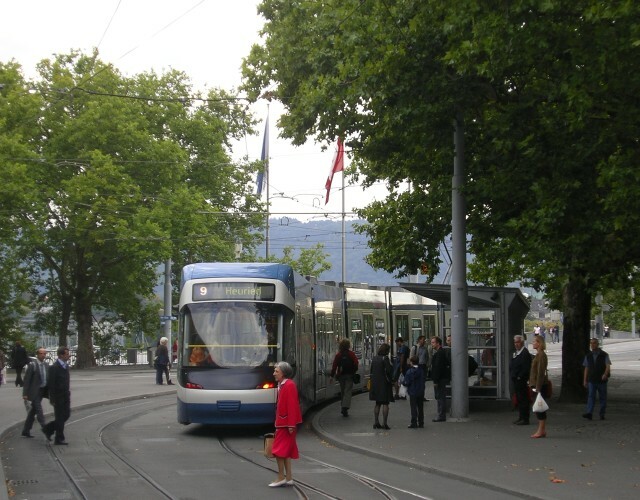 25th November will also see a referendum on the acquisition of new trolleybuses in Sankt Gallen. Back in Zürich, Cobra deliveries have reached at least 3041. The next special football livery is likely to be applied to 2087 + 2428, which have been running in an all-white for some time now. 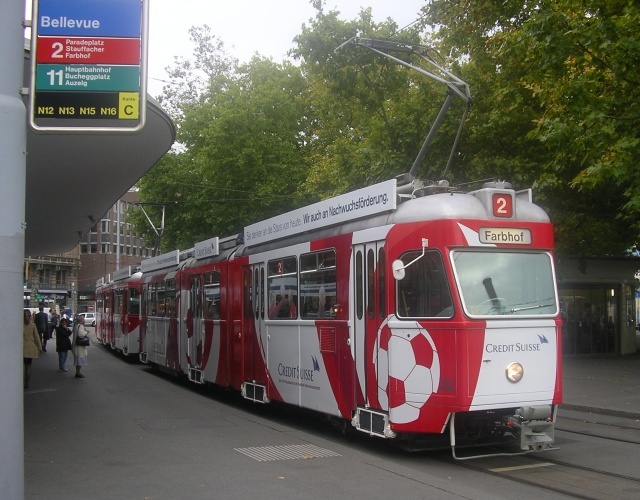 Other Swiss tram systems are similarly decorating vehicles. 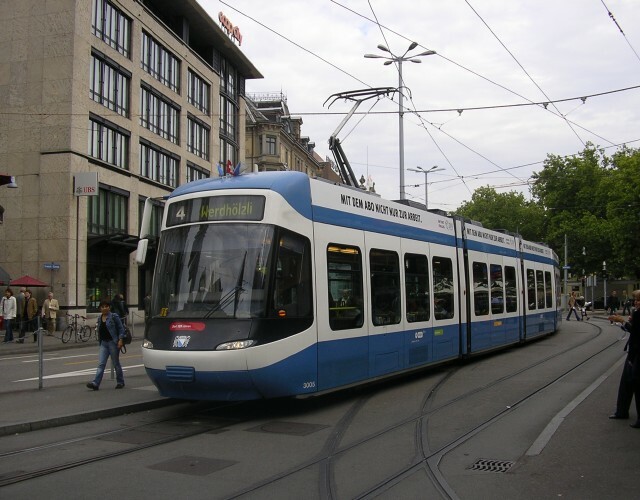 According to a report on Bahnhofplatz.net, the modifications to the trolleybus overhead at Klusplatz appears to be to permit a dismantling of the service connection to Hegibachplatz where the latter can no longer be accomodated due to the need to extend the tram and Forchbahn loading island. Until 1999, this non-revenue wiring was the only means of transferring trolleybuses from the Witikon line to the rest of the network (and especially the depot). The extension of route 33 to Tiefenbrunnen in that year meant it met the 34 at Klusplatz, making a direct connection the more obvious way of achieving this link — however, only the recently installed wires make this practicable. Tram magazine (issue 91/09-11.2007) returns to the discussion surrounding the fate of Cobra 3006. 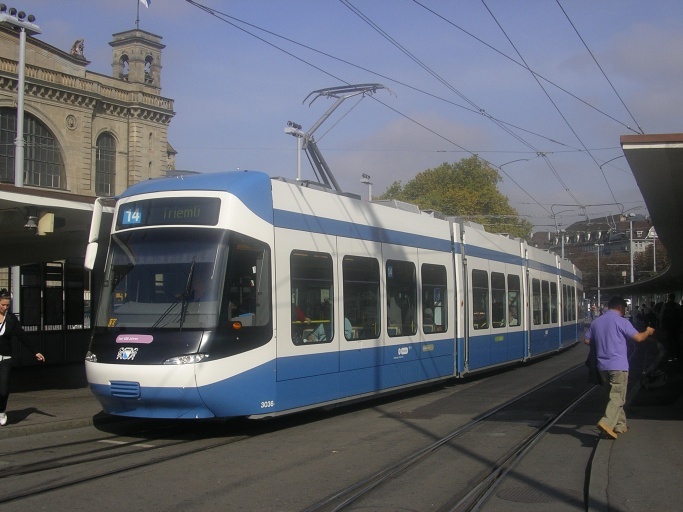 In the December issue of 2006, it was stated that this vehicle had been scrapped, with body segments set aside to become an information stand for Tram Zürich West (the latter has not materialized). In May, when a (new?) tram appeared with the number 3006, it was widely claimed that this was a replacement provided by Bombardier, and that the other prototypes (which have similar flaws in their construction) would be similarly replaced. The June edition of Tram magazine then confirmed this. 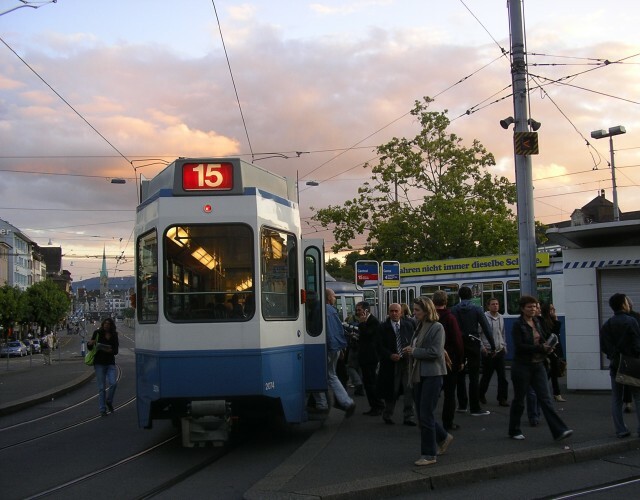 It is a sign that such journals are not scrutinised only by enthusiasts, that Lorenz Habicher, a member of the cantonal parliament for the SVP party and opponent of Tram Zürich West, raised the issue demanding to know whether public money was being wasted. It was vehemently denied by VBZ that the vehicle had been scrapped, it being explained instead that 3006 had been rebuilt by Bombardier to bring it up to the standard of the series fleet. In the latest issue, Tram magazine apologises for causing this uproar and also subscribes to the latter explanation. In my opinion, the difference between a heavy rebuild and a new tram is a matter of definition. It is clear that substantial parts of the body have been replaced (with notably a transition from the screw-based Alugrip, as also used on the Combino type, to a welded construction), with it being highly probable that parts such as motors, electrics and running gear have been re-used. It was a praiseworthy decison on the part of VBZ to acquire prototypes, so preventing far more costly repairs. Various detail differences set the Cobra prototypes (upper picture) apart from the production units (middle picture), most notably the shape of the panelling are air intakes on the sides. As a flashback to when the prototypes were new, here is a view of their original livery (as designed by Pininfarina). The more generous use of blue creates an overall darker impression. Further news from Tram magazine: Mirages having received overhauls are (RA) 1676 (following accident damage) and 1685 and (SK) 1602/5/935/83 (observant readers of this website will recall that 1683+1717 now carry a football livery). 1692/4-6/703-6/9/22/6 are reported out of service. Tram 2000's overhauled are (R1.2) 2004-6 and (R2.0) 2087/314/417/23/8. Mercedes trolleybuses scrapped are 1/2/13/22. 5 is sold to Verkehrsbetriebe Winterthur and 6/15/29-30 stored in Regensdorf with 35 also being withdrawn. 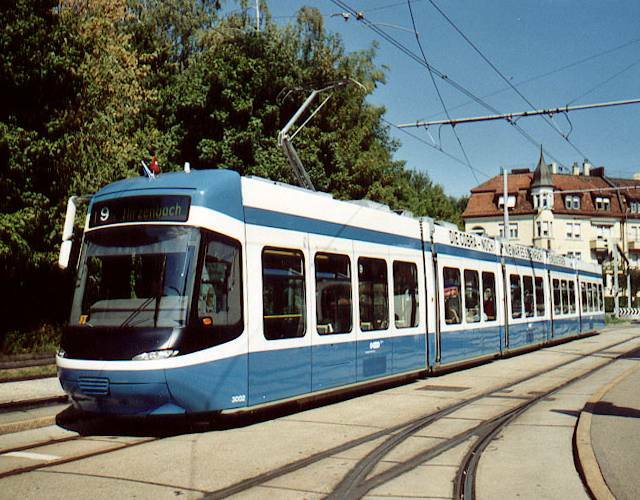 Stadtbahn Limmattal is also back in the news, with Tram magazine reporting that the planning body ZPL (Zürcher Planungsgruppe Limattal) demanded in May that the project be accorded higher priority. The planners are demanding construction begin in 2016 for an opening in 2022. 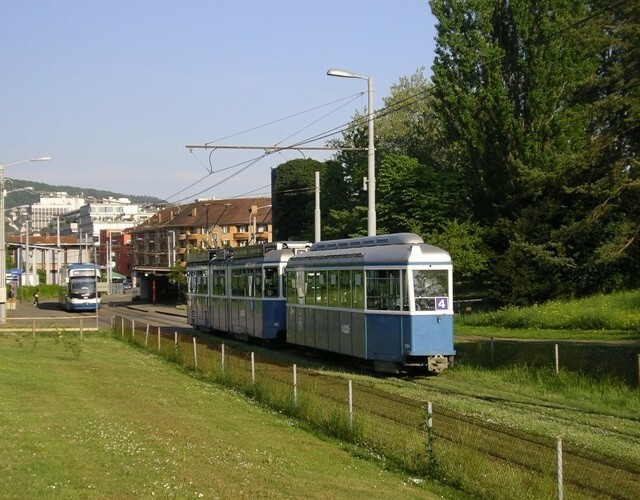 Stadtbahn Limmattal is a project to create a tram corridor from Zürich via Schlieren and Dietikon to Killwangen, and possibly beyond. It would connect to BDWM in Dietikon and open possibilities of through running. The magazine's main article deals with the history of Basel's trolleybus.